Inhale and pull the bar down to your upper chest by pulling out your chest and bringing your elbows back. 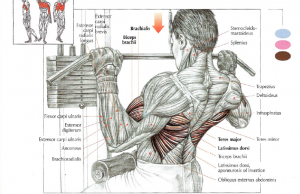 This exercise works the superior and central fibers of the latissimus dorsi, teres major and a little bit the trapezius (middle and inferior portions), rhomboids, biceps, brachialis, and pectoralis major. This exercise is excellent for developing back in thickness.